CHIEF RON WHITE, SR., 66, was born November 20, 1949 in Pontotoc, MS and passed away August 14, 2016 at Baptist MemorialHospital – DeSoto. Chief White was the first Southaven Firefighter, serving as fire inspector. 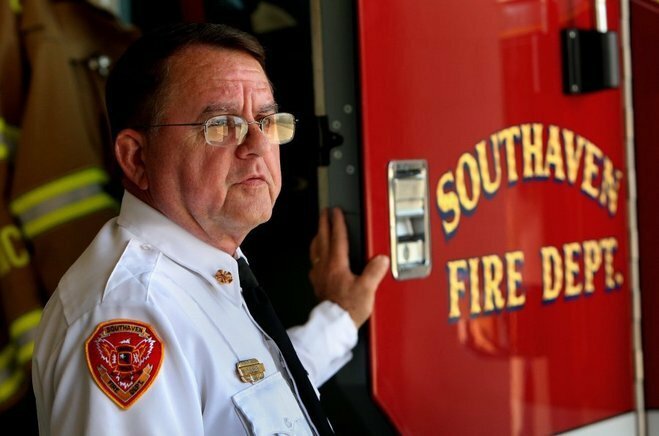 He was instrumental in the growth of Southaven’s Fire Department and led the department as Chief until his retirement earlier this year after 43 years of faithful service. According to Chief White, the best time of his career was when he served as an ATF agent and had a working dog named, K-9 Agent Warner. He will be laid to rest with Warner. He is survived by his loving wife of 49 years, Ann White; one daughter, Missie White James; one son, Ron White, Jr. and his wife, Sharon; one brother, Mike White and his wife, Debbie; three grandchildren, Chelsea Hickerson and her husband, Nathan, Ronnie White, and Devin Free; and one great grandchild on the way. Visitation will be Thursday, August 18 from 6-8 p.m. at Colonial Hills Church, 7701 Highway 51, Southaven, MS. The memorial service will be Friday, August 19 at 1 p.m. at the church. In lieu of flowers, the family requests that any memorials be made to the Mississippi Burn Foundation. Arrangements are in the care of Twin Oaks Funeral Home in Southaven. Ann, Missie and Ron you are in our thoughts and prayers. Ronnie was a wonderful man and will be missed by everyone. Uncle Herman and Aunt Evelyn thought he was a special person. I know he was a great asset to Southaven Fire Department and was well respected. Mom, Donna and Margaret love you all very much. Very sad to hear of Ron’s premature passing. Although we did not stay in close contact for the past 50 plus years, I thought of him often. We spent some of our very informative youth together while living on Dempster Street in Memphis. My prayers to Ron’s family and friends.